Massoud, Mohammad, Ghalehnoee, Mahmoud, Shookouhi, Mahmoud. (1396). Examining the Order of Urban Blocks from the Perspective of Environmental Perception in Comparison between 2 Districts: Khaneh-Esfahan and Mardavij of Isfahan. معماری و شهرسازی آرمان شهر, 10(18), 111-120. Mohammad Massoud; Mahmoud Ghalehnoee; Mahmoud Shookouhi. 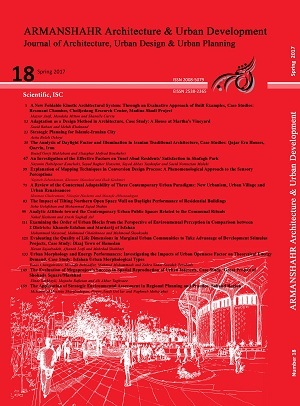 "Examining the Order of Urban Blocks from the Perspective of Environmental Perception in Comparison between 2 Districts: Khaneh-Esfahan and Mardavij of Isfahan". معماری و شهرسازی آرمان شهر, 10, 18, 1396, 111-120. Massoud, Mohammad, Ghalehnoee, Mahmoud, Shookouhi, Mahmoud. (1396). 'Examining the Order of Urban Blocks from the Perspective of Environmental Perception in Comparison between 2 Districts: Khaneh-Esfahan and Mardavij of Isfahan', معماری و شهرسازی آرمان شهر, 10(18), pp. 111-120. Massoud, Mohammad, Ghalehnoee, Mahmoud, Shookouhi, Mahmoud. Examining the Order of Urban Blocks from the Perspective of Environmental Perception in Comparison between 2 Districts: Khaneh-Esfahan and Mardavij of Isfahan. معماری و شهرسازی آرمان شهر, 1396; 10(18): 111-120. 1Associate Professor of Urban Design, Architecture and Urban Development Faculty, Art University of Isfahan, Isfahan, Iran. 2AssociAssociate Professor of Urban Design, Architecture and Urban Development Faculty, Art University of Isfahan, Isfahan, Iran. 3Ph.D. Student of Urban Design. Architecture and Urban Development Faculty, Art University of Isfahan, Isfahan, Iran.